This is the twelvth of Dean's books, launched July 2014. From Global Baker Dean Brettschneider comes this mouth-watering collection of more than 60 bread recipes plus detailed step-by-step instructions on artisan bread making techniques. 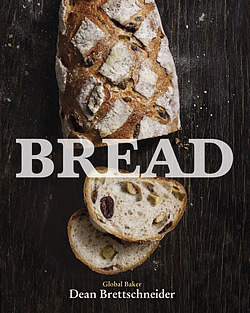 Bread by Dean Brettschneider is the definitive collection of irresistible recipes from a truly global baker, with stunning photography from leading food photographer, Aaron McLean. Whether you fancy a bagel or a baguette, sourdough or sticky buns, these delectable and easy-to-follow recipes are sure to become firm favourites. As one of New Zealand's most respected bakers, with more than 25 years of experience, Dean's in-depth knowledge of ingredients, equipment, processes and techniques will help you achieve the delicious taste of perfect freshly baked bread - whether healthy, savoury or sweet - to share and enjoy with family and friends. Dean's indispensable expert knowledge will show you how simple it is to start baking, by mastering basic breads, such as a simple scone or a farmhouse loaf. When you've practised and gained an understanding of the taste, texture and feel of the dough, you'll have the confidence to move on to more ambitious breads. There is no limit to the different breads you can achieve with Dean's step-by-step advice - from baking a crusty ciabatta through to growing your own sourdough starter to create the ultimate pain au levain. You will be amazed at the quality, lightness, volume, flavour, crust and crumb of your bread after following Dean's recipes, tips and know-how in his irresistible new book, Bread. His global baking influences will add a new twist to your artisan loaf. - As a good friend of mine once said, "Bread is the new coffee" - and the success of Dean's Global Baker brand and the growing demand for the modern artisan loaf suggests this might well be true! Bread is the definitive cookbook for bread baking today. Dean Brettschneider is a professional baker, pâtissier and entrepreneur. Arguably one of the world’s best bakers, with an international following, Dean is truly a global baker. He resides in Denmark, Singapore and New Zealand, where he heads up his global baking empire. He travels regularly and consults in Europe to the baking industry and to many large retailers. Dean is also the founder and co-owner of the global bakery chain Baker & Cook, which has its flagship store in Singapore: www.bakerandcook.biz. Find out more at: www.globalbaker.com. 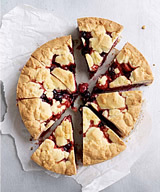 Dean Brettschneider is a professional baker and pâtissier with an international following. Known internationally as "the Global Baker", Dean is a professional bakery adviser, widely respected as a skilled and innovative craftsman. Working in Asia, the USA, Britain and Europe as well as in New Zealand, Dean has earned many accolades and awards in bakery competitions and exhibitions.